Everyone who works with SketchUp, sooner or later, will face the need to share a presentation of his models with other people, but frequently without sharing the original file. There are some solutions available to perform this task, but recently, I found a new project - Kubity - and it looks very handy. Kubity transforms easily, any Sketchup file in a "visitable" model, directly in your browser, without any need of plugins. 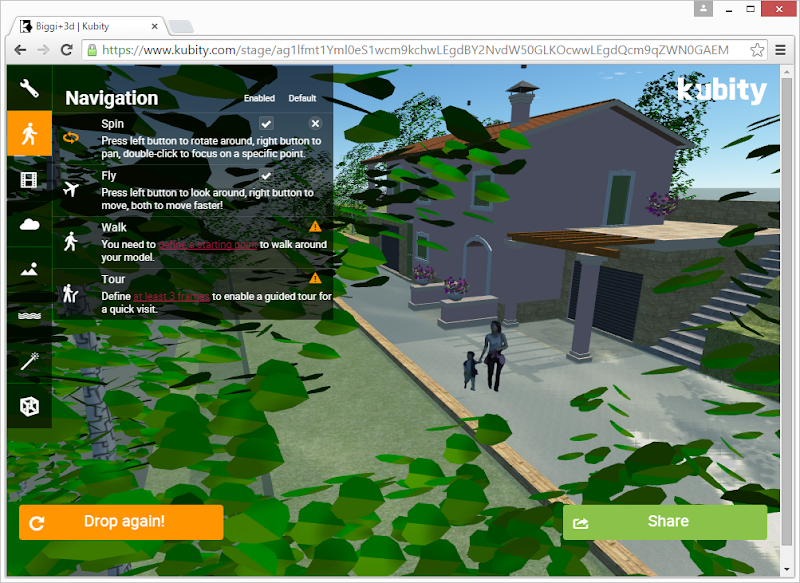 All one have to do, is drag the file to the Kubity site and after the upload ends, configure the scene, using the available options for sky, terrain, water and "smart objects" such as trees, particles (fire, fountains) or links to external pages. An important issue to refer is that the configuration process is very fast and also very easy to learn. Kubity is a recent project, so it's in constant evolution and new features are being introduced regularly. For now, it works well in Windows 8 with Firefox or Chrome and it may be used in mobile platforms. Currently I'm using Kubity in my work, everytime I have to show my Sketchup models to clients or colleagues, (I find it far more interesting and flexible than Sketchfab, for instance), so why don't give it a try? Nice work with the baggage handling system and the roman villa! Kubity is indeed a handy WebGL renderer and provides several navigation modes and other useful features and scene enhancements.